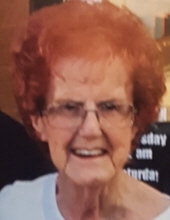 Shirley Ann (Nicholas) Clark age 82 passed away on Saturday February 9, 2019 at Glen Oaks Health Campus. She was born May 16, 1936 a daughter of the late Walter and Hattie (Hughes) Nicholas. She was a graduate of Spiceland High School class of 1955 and have worked for Tractor Supply for over twenty five years. She enjoyed family activities and Bingo. Survivors include her sister Frances Madden of Hudson Florida, a grandson Kyle Baker two great grand daughters Kennedy Baker and Destiny Reece of New Castle, daughter in law Vicki Parkhurst , granddaughter Liz Bailey and great granddaughters Jordan, Olivia and Makaela Bailey of Knightstown. She was preceded in death by her three sisters Josephine Hammond, Fonza Parker and Marcella Maloney, her brothers Amos, Andy and Jerry Nicholas, her daughter Angela (Parkhurst) Baker and a son Gerald Parkhurst. Family and friends may call from 3 to 5 pm on Wednesday February 13,2019 at Macer Hall Funeral Home and Cremation Service. Macer Hall funeral directors are honored to serve the family of Shirley Ann Clark. To send flowers or a remembrance gift to the family of Shirley Ann Nicholas Clark, please visit our Tribute Store. "Email Address" would like to share the life celebration of Shirley Ann Nicholas Clark. Click on the "link" to go to share a favorite memory or leave a condolence message for the family.